It took me awhile to finally share this review. First of all, I was pretty much emotionally wrecked by this movie. Second, I need more time to be more objective. But anyway, it's no longer matter because now it is completed. I have watched Avengers: Infinity War five times now - I was shaking the first time I watched it, had to go to the toilet and called my boyfriend because I couldn't handle myself! By the third time, I felt like I paid attention more to the storyline and production rather than my feelings and how I felt about the whole thing. Please be wise that this is a SPOILER review - means that I am spilling the tea: from the least spoiler thing to the biggest reveal. I don't even know where to start, this movie very different with the rest of Marvel movies and it is a great thing! Infinity War begins with non-traditional Marvel opening, it goes straight to the middle of Thor (Chris Hemsworth) who looks like beaten up pretty bad, Loki (Tom Hiddleston) who looks very scared but still pretends he's tough and Heimdall (Idris Elba) who's dying. Obviously, it takes time right after Thor and Loki saw Thanos' ship in the after credit scene on Thor: Ragnarok (2017). So... Thanos (Josh Brolin) has arrived. More than just arrived, he already owned one of Infinity Stones and wants more. Infinity War is pretty much Thanos movie as promised. We learned more about who is he, his past and his intentions. His idea of merci by killing half of universe is just mad. Thanos is madman. Although we know where are the Infinity Stones (except one!) and pretty much know Thanos will get all of them, this movie delivers the journey in depth darkness, complicated way. Some of them probably too much to handle especially for younger viewers but honestly, the classification is self-explanatory. Thanos has arrived. He owns two Infinity Stones in pretty much the first 10 minutes, Loki and Heimdall died, Hulk (Mark Ruffalo) is thrown to Earth and harshly landed in New York, at Bleecker Street where Dr. Strange (Benedict Cumberbatch) and Wong (Benedict Wong) are talking about money. Meanwhile in other side of New York, in the Central Park, Tony Stark (Robert Downey Jr.) and Pepper (Gwyneth Paltrow) are having a conversation about expecting. More to the other side of New York, Peter Parker (Tom Holland) is on the bus with his classmates, those briliant kids are on field trip. Where's the rest of Avengers? We knew since Captain America: Civil War (2016), Avengers broke up. They're splitting into two - or three, I don't know. So, we all wondering... where's Steve Rogers (Chris Evans) when we need him? I'm not sure where he was before but he shows up in Scotland to save Wanda (Elizabeth Olsen) and Vision (Paul Bettany). He's not alone, of course, he is with his best buddies - Natasha Romanoff (Scarlett Johansson) and Sam (Anthony Mackie). Infinity War is full of surprises and action scenes. It packs with heavy action sequences but still funny when it needed. That's what I love about Marvel. To balance all the darkness, every now and then we hear classic Marvel jokes. The best way I can explain is this is a combination of Marvel movie and very long Game of Thrones episode where bad things actually happen. Many people died... or vanished. Yes. Major characters. Major villains. The film switches across the cosmos from one group to the next, turning the screws on each group, shattering them and pulling them back together in new combinations. 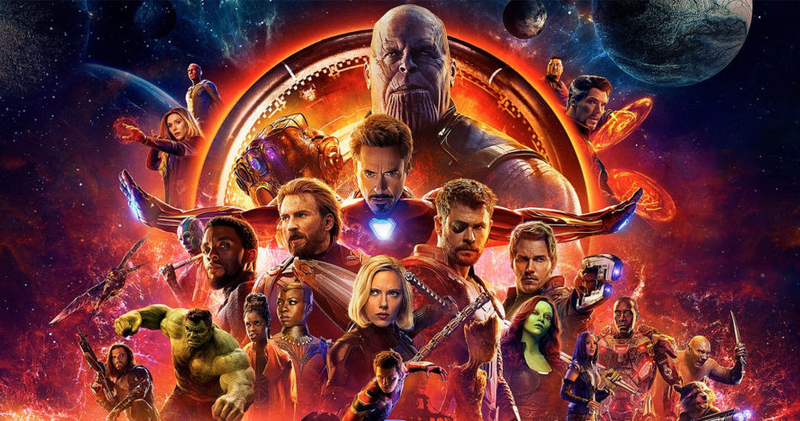 While Infinity War brings together all these characters, it also is audacious enough to introduce new faces, though most prove to be missteps due to a lack of time to develop them into anything worthwhile. The Children of Thanos – his four henchman, also known as the Black Order in the comics – are essentially CGI boogeymen who are effective foes for the fight scenes, but there’s little else there to give them gravitas as villains. Game of Thrones’ Peter Dinklage, on the other hand, is memorable in his still-secret role. Then again, much of Infinity War dwells in the murky area between what it has promised, and what it wants to surprise us with. Yes, many of our expectations are satisfied, but at the same time there are curveballs thrown that will keep viewers guessing. The film is all the stronger for it, as it consistently subverts the expectations it sets up for the audience. This movie is huge. It's massive. With nearly three hours rundown, I did not find any moment which bothers me - well, one actually, unnecessary subplot between Wanda and Vision. Oh, two, Gamora (Zoe Saldana) and Peter Quill (Chris Pratt). I'm sorry but I don't think it should be there. Anyway... what I love the most about this movie is all the characters development. For instant, Thor. He's always been the in-between hero until Thor: Ragnarok where he got all of his power. He became literal God of Thunder. But, like I said in review, the hammer is not his power, its inside of him and he needs something to release. In this movie, he's the best. Understandably, he's basically a God but think about it, all the years we watch him, he never really this great. He lost everything, everyone, and like he said, rage is the best motivation to revenge. He has strong will to defeat Thanos and he doesn't feat anything. Why? Because... "What more I could lose?". The conversation between Thor and Rocket (Bradley Cooper) is the best. It shows how exhausted he is with all the fights but also he wants to fight more because he know he could. Another character development that I love is Dr. Strange. Some people got really angry because he doesn't do much in this movie but remember, when he calculated the possibilities they have to win over Thanos, he's the only one who knows (and sees!) how those over 14 million times Thanos will win and they only have ONE chance? He sees how it ends! He knows more than the rest of the universe and he knows how. That's why, he let Thanos has every stone because that one presumption he believes the best. Remember when Strange and Tony fight on the flying donut? He said to Tony, he won't bother to save either Tony or Parker if it comes to the time stone. We know how arrogance Stephen Strange is, right? What he said is what he meant, so why he changes his mind when Thanos stabs Tony and even asks to spare Tony's life in exchange with the stone? Because he's creating their way to win. In order to win, we have to lose on the situation first then rise. Again, remember what Loki said before he died, "I promise brother, the sun will rise again." He didn't bother to hide Tesseract even he could. Why? Because he also know the Avengers will win over Thanos but not with hiding the Infinity stones. He rather to save Thor and sacrifice himself because that's the chance. Thor. The ending is very devastating for me. Yes, half of universe vanished. At first, I didn't understand WHY and HOW Marvel will bring those characters back - because we know, Dr. Strange, Black Panther (Chadwick Boseman), Spiderman and Guardians still have contracts left. And I know no one in Marvel really dead... but still, those scenes are just punch me in the face. I also think it has something to do with Quantum Realm which the concept of time and space become irrelevant. Ant-Man and the Wasp is coming in two months and I think it's either happens around Infinity War or after. It's either sets up the Ant-Man or Ant-Man is trying to fix what already happened. More to the theory... Captain Marvel (Brie Larson). In the one and only after credit scene, Nick Furry (Samuel L. Jackson) calls her on pager before he vanished. My question is... why he didn't call her before? Where's she this whole time? But what makes it interesting is, the pager is ONLY for calling her. Just like the phone Steve gave to Tony. It's just one number, one call to need. She must be the key to this one chance to outcome Thanos. Everything is connected. Quantum Realm will also appear in Captain Marvel standalone movie. See the connection? Infinity War ends in one big cliffhanger, it ends pretty much in the middle of the book if it's a book. We just need to wait another year to find out more. By that I mean waiting in vain. Free zmovies watch now. But the work in 2019 is likely to be "the pinnacle" without ever knowing whether the brand can be repetitive. The Avengers 4 success of Avengers' $ 2 billion: Infinity War (2018), and Disney and Marvel Studios will take another 10 years to produce such a big project. What is the future of James Bond when there is no Daniel Craig and have to rebuild from the beginning? How will the audience react when Star Wars is no longer relevant to the Skywalker family? How will Disney's X-Men be portrayed if they are in the hands of the brand? These are certainly not easy questions to answer.